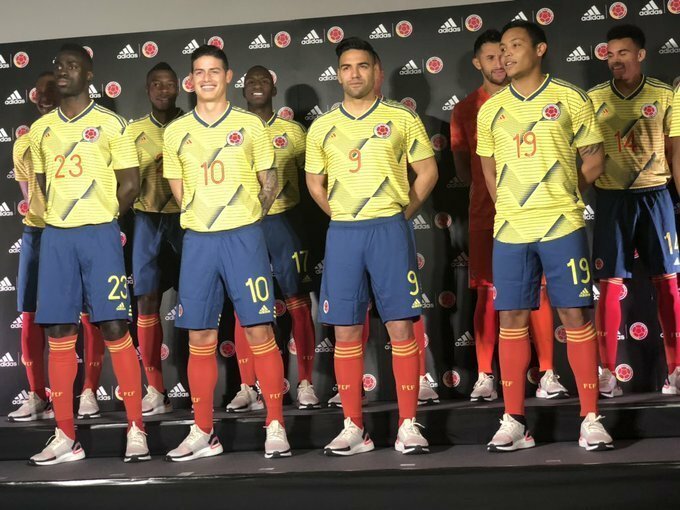 Colombia is one of three Adidas national team to receive a new home kit in 2019, after Argentina and Mexico. The Colombia 2019 Copa America shirt will be worn at the continental tournament in Brazil in June and July. This is the Colombia 2019 home jersey by Adidas. Similar to Argentina’s, Colombia’s new Copa America home kit introduces a subtle color change, in this case to a more light, less saturated shade of yellow. A very controversial style, the Colombia 2019 Copa America home shirt features a 1990s-inspired all-over print graphic. It consists of horizontal lines of differing withs. The shorts of the new Colombia 2019 kit are dark blue, whilst the socks are red. The 2018 World Cup away shirt will get carried over into the 2019 Copa America, just like it’s the case with Argentina and Mexico.